Bassekou Kouyate was born in Garana, a small and multi-ethnic village 60 km from Segou located at the banks of the Niger river. He is descended from a long line of griots on both sides. 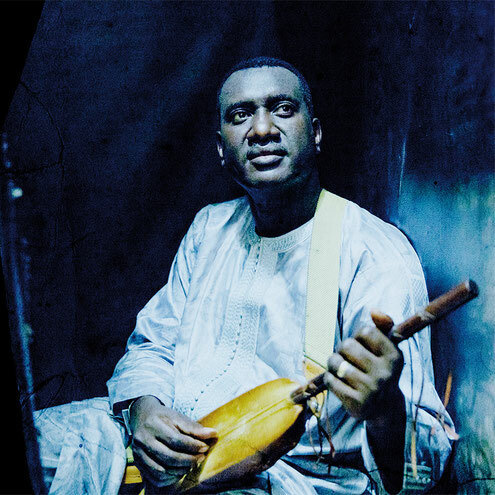 In the mid eighties Bassekou started playing the traditional sumu circuit, which soon put him in touch with another extraordinary musician such as the kora player Toumani Diabate. At the end of the 1980s, Bassekou became a founding member of Toumani Diabate’s Symmetric Orchestra, which then included among others a young Habib Koite as lead singer. It was the Symmetric Trio that brought Bassekou to Europe for the first time to play at the festival in Dranouter in Belgium in 1990. Later that same year, Bassekou made his first trip to the USA, where he met the African American blues musician, Taj Mahal. In the mid 1990s Bassekou married Amy Sacko, a fine griot singer originally from northwest Mali. As a couple, they produced a number of popular cassettes and were in constant demand on the wedding circuit and on Mali television, where Amy was nicknamed “the Tina Turner of Mali”. In 2005 Bassekou was invited by Mali’s “desert bluesman” Ali Farka Touré to play on his album ‘Savane’ and to join Ali on stage for his final tour in the summer of 2005. In the same year Bassekou decided to create his band Ngoni ba. a quartet of different sized ngonis. It was a novel idea, but it was also very old – the rulers of precolonial Segu sometimes had bands of up to 30 or 40 ngoni players, all playing together. Since than Bassekou Kouyate & Ngoni ba have toured the world playing 100rds of shows from NY Central Park to the Royal Albert Hall in London, from Roskilde to Glastonbury. Lately he performed with Africa Express and charged stages with musicians like Sir Paul McCartney, John Paul Jones, Damon Albarn and many more.